Sometimes while watching a Twitch stream, you just need to be heard. Maybe inspiration bonked you on the head with a joke or a catchphrase, or maybe you attempted a battle cry that sounded like a cross between a shrieking mountain goat and the majestic mating calls of a manitoban elk. And you immediately think, "I gotta share this to everyone in the stream. 723 times, in fact." We want to empower viewers with a voice, and that's why we started Voicemail. Voicemail lets Twitch viewers record a short audio clip (5 to 10 seconds) and blast it to everyone in the stream. Typing out words isn't enough anymore--you gotta audio-comment it out! Let your fellow viewers hear your thoughts; mesmerize them with your sultry voice; regale them with the songs of your people! I'm sure it'll be a fun time for their ears. We utilized some great tools (thank you Twitch and AWS) to build Voicemail. The first challenge we ran into was recording. We realized that the Twitch iFrame would not allow recording. To work around this, we built a 3rd party site for people to generate a recording and be given a code. They can enter this code back in the Twitch extension to pull the mp3 data from our backend. Next, we wanted to have the ability for voicemails to be sent to everyone in the stream. However, we ran into some interesting limitations with iFrames, and we discovered that after a broadcast was received, audio would not play unless a user had already clicked on the extension. This still remains a current limitation of our extension. However, we realized this may actually work out in a positive way, and realized that not everyone may want to participant in sending and receiving voice messages. 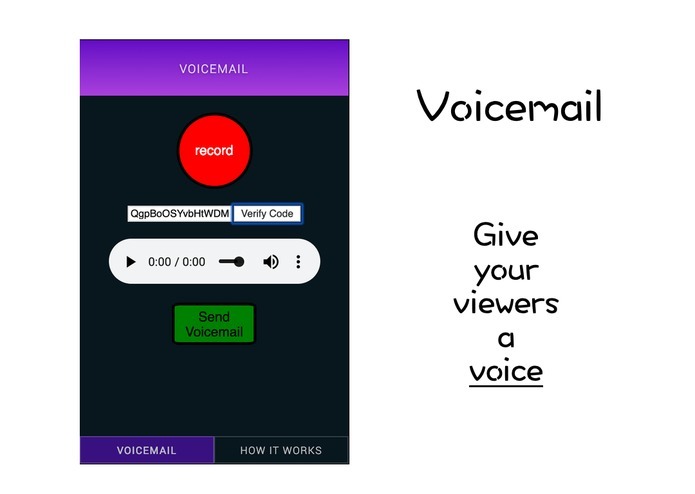 This gives users and streamers the control over whether or not they will receive voicemails. We are extremely proud that we were able to work through some technical hurdles to provide a working tool on Twitch. This application makes use of many APIs and technologies, but we've strived to make it simple and easy for a user to understand. We have also given users the control over whether they want to engage in.. well.. we'll find out! We look forward to working more closely with Twitch to discuss future ideas and continue pushing the boundaries of what extensions can do and provide for communities.